This stunning country contains a kaleidoscope of landscape, wildlife and people that is infinite in variety. Boundless stretches of savannah are dotted with herds of game – wildebeest, zebra, gazelle and every other herbivore you can think of; a lion or cheetah stalking through the tall dry grass; warriors dancing in the warm hues of sunset; stretches of silver beach fringed with palms swaying in the warm ocean breeze; dawn breaking the early morning mists over shimmering deep blue lakes; rivers snaking their way through parched land, ribbons of green on either side celebrating the joy of life with all the animals around; rich tropical forests filled with the rioting sounds of life that somehow stays invisible; a monolithic snow-capped peak rising out of and floating majestically over parched and dusty plains. You will find all this and more in Tanzania. Situated just south of the Equator, Tanzania is the largest East African nation – it is half the size of western Europe and is bordered by shimmering lakes and the Indian Ocean. Off its white sandy beaches lie the sleepy islands of Pemba, Mafia and exotic Zanzibar. Lake Tanganyika, Africa’s longest and deepest freshwater lake and the second deepest in the world, runs along its western border. In the northwest, in a massive shallow depression, is the source of the Nile, Lake Victoria. Tanzania is also home to the famous vast roaming herds of the Serengeti plains game and the snow-capped wonder of legendary Kilimanjaro. Not surprisingly, nearly a quarter of all of Africa’s game is found on the savannahs of this country, one quarter of which is made up of national parks and reserves. You’ll find that all the statistics point to one overwhelming fact, Tanzania is a country made for ‘Safari’. Lying in the shadow of Mount Meru is an attractive town that serves as an agricultural centre and safari base. Situated in a fertile temperate region, this former trading post has over the years developed into an administrative centre for the important agricultural area all around. Divided roughly in half by the Naura River, here you will find craft shops selling unique Makonde carvings as well as the famous meerschaum pipes. When the Jacarandas are in bloom, the park and side streets are aglow with a pastel purple beauty. Arusha’s lively and colorful market reflects its rural background. As you wander through the narrow alleys you will find everything from fish and meat to fruit and pungent spices. Lake Duhiti, a water filled extinct volcano presents the ‘dreamers’ with a picturesque picnic spot just outside Arusha. Rising 5,896 meters (19,340ft) from the stark flat dry savannah plains, snow-capped Kilimanjaro is a spectacle of pure unadulterated beauty. A sight so stunning, it can only dominate and etch itself into one’s memory forever. The mountain owes its existence to the formation of the Great Rift Valley and is actually three volcanic cones that, due to their proximity, became one – Shira, Mawenzi and Kibo – together they make the highest free standing mountain in the world. It is possible to climb this ‘wedding cake’ mountain all year round although the best times are the dry months of January, February and July through to September. Anglers can find trout in the delightful crystal cold rivers up to a height of 2000 meters (6557 ft). The most interesting aspect during the climb is the textbook vegetational graduation – distinct bands of vegetation at different altitudes. First one comes across grassland where at night, one can hear the clatter of galagos and can see the genet cat, although this zone is most notable for its prolific birdlife. Next there is the damp forest zone. Dense trailing fronds of lianas hang everywhere from trees with heavily buttressed trunks. Here a wealth of animal and birdlife abounds as does the Impatiens Kilimanjaro – a scarlet and yellow flower found nowhere else in the world. The alpine zone is made up entirely of giant hearth and moorland and here you may catch sight of rare birds of prey. The auger buzzard, Mackinder’s owl, Verreaux’s eagle and the Lammergeier who mostly feed on rodents. The last two zones of highland-desert and summit are the most testy with about half the oxygen at sea level, high ultraviolet radiation by day and freezing temperatures by night. Those who conquer this enigmatic mountain, will find themselves left breathless for more than one reason. Described by Hemingway in the “”Green Hills of Africa””, this once prime hunting ground is today a national park of unsurpassed beauty. Lying on the floor of the Eastern Rift Valley, Lake Manyara spreads out in a shallow depression, dominating the scene and standing out starkly against a backdrop of the sheer red cliff of the western escarpment. One enters Manyara from the village of Mto wa Mbu or ‘Mosquito Creek’ – the only place in Africa where one can hear the four major language groups. The entrance of the park is dominated by a rich groundwater forest. Here elephants feed on the fallen wild fig and blue monkey, vevet, baboon, bushbuck, waterbuck, nocturnal aardvark, civet, pangolin and leopard can be seen. Buffalo and hippo wallow in the nearby Hippo Pool where most of the park’s 380 species of birdlife can be spotted. The vegetation eventually merges into flat-topped acacia woodland where, in the heat of the day, entire prides of lion can be seen stretched on the branches of these trees – a habit only endemic to Manyara lions. Along with these amazing tree-climbing lions there are the usual browsers and grazers as well as the interesting banded mongoose. Two thirds of the park is dominated by the slightly alkaline lake which is home to a seemingly endless variety of water birds. At 18 kilometers (11 miles) across, the Ngorongoro Crater is the largest perfect caldera in the world. 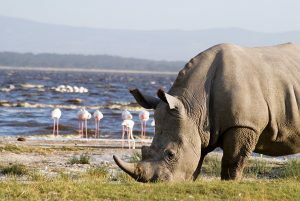 This outstanding wonder is only one of the attractions within a vast and diverse conservation area. High mountain forest extends to the lip of the crater. Crotons dominate the low altitudes which blends into red thorn acacias, pillar woods and strangler fig as one moves higher. Among the branches of the dense green canopy, a variety of bird species search for food in the partial gloom. The forest then recedes to give breathtaking views of the crater’s vertiginous void. Grasslands, swamps, lakes, rivers, woodlands, mountains and wildlife are all present in this wondrous microcosm of Africa. As you descend, Lake Magadi is centre stage with Seneto Springs to the left, Gorigor Swamp to the right and the Terai Forest in the foreground. The Gol mountains nudge the far crater rim. Grazers dominate with zebra, wildebeest, gazelle, buffalo, eland, hartebeest, warthogs and intriguingly, only bull elephant. Lion and hyena frequent the many ponds, with the nocturnal side-striped jackal predators. Ostrich and kori bustard are the distinctive grassland birds. The swamps, ponds and rivers support an ever present population of water birds and during the wet months the open pools play host to a variety of Eurasian migrants. Between Ngorongoro Crater and Serengeti plains lies the narrow fifty kilometer long (31 mile) strip of the legendary Olduvai Gorge – where some of the most important fossil humanoid remains have been unearthed. The gorge has been a surprisingly productive site for archaeological excavations due to a number of important factors. Millions of years ago the area was abundantly inhabited by many species of animal. Finds have shown these to include a saber toothed big cat, a horned giant giraffe, two kinds of elephant and various predecessors of today’s plains game and of course, early man. Together, all their remains were preserved in the alkaline mud of the lake that once covered the area. Over the centuries these were fossilized and only exposed recently when a seasonal river cut through the ancient beds. It was here that the Leakeys discovered the partial skull of the now famous Zinjanthropus, who lived some 1.75 million years ago. In places, the gorge rises up 60 meters (197 feet) and the layers of sediment deposited in the ancient lake can be seen clearly. The bones and teeth of over 150 species of animal have been excavated from the gorge’s rich stretch and an almost continuous record of human habitation has been recreated from excavated artifacts, from the earliest tool users to the Stone Age. The name comes from the Masai ‘siringet’ which means ‘endless plains’, and the Serengeti is just that. Within its 14,763 square kilometers (5,000 square miles) dwell an estimated 3 million large animals – this is one of the world’s last great wildlife sanctuaries. It is from here that the famous army of grazers begins its legendary trek in search of new grazing lands. The best time to see heavy concentration of game is between January and February. 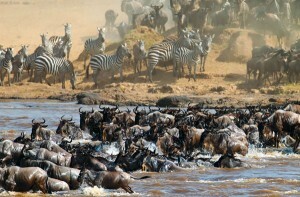 Life on the Serengeti is a complex cycle, the defining factor of which is the rain. Though the precise timing varies each year, it usually occurs around May. The columns of herbivores stretch up to forty kilometers long (25 miles) as they make their way up north toward Kenya’s Masai Mara from where they eventually return some eight and a half months later. Packs of wild dog usually follow, preying on the sick and weak. Cheetah, lion, leopard and hyenas can be frequently spotted at a kill but – more so in the Seronera Valley which is characterized by an amazing abundance of mainly lion and leopard. Often rock hyrax can be spotted on granite mounds in the sunset over Serengeti plains, they burrow close to these small outcroppings keeping a watchful eye out for serval cat and jackal. Swahili for “”haven of peace””, Dar es Salaam is Tanzania’s capital, a perfect tropical port situated on the shores of a scenic palm fringed bay. Kurasani Creek, one of the world’s finest natural harbors is a somewhat surrealistic mix of modern freighters and yachts, and ancient dhows and dugouts. The city as well is a dynamic collage of ancient and contemporary. There are narrow winding streets and low buildings dating back to the Arab period, two story houses and a Bavarian style railway station from the German colonial era, and everywhere else there is an intriguing mix of African and Oriental architecture. The city’s Botanical Gardens are a riot of color with everything from pink oleander to scarlet flame trees. Across from the gardens is The National Museum with its outstanding display of fossils and artifacts from Olduvai Gorge. At the main Kariako Market – a popular meeting place – the atmosphere is lively and colorful with all manner of goods available for sale. Dar es Salaam’s Afro-Swahili origin offers up tasty culinary delights from smoked octopus served in newspaper triangles to aromatic curries of a great variety of fish. All one has to do to get away from the heat, humidity and crowds is travel some six kilometers (four miles) away to beautiful white beaches, lazy palms swaying in the cool breeze and the surf constantly washing the shore. Zanzibar is an exotic land. This spice island is a tropical idyll true to its reputation. Zanzibar town is filled with old historic buildings, and to prove it there is a story behind each one. At the heart of Zanzibar is the fascinating Stone Town where time has seemingly stood still. The island is dotted with several ruins from the turbulent times past. During harvest season, between July and December, the air hangs thick with the scent of clove. Along the east coast there are endless beautiful beaches and inviting aquamarine waters. Half a day’s dhow ride from Zanzibar is the true clove capital of the world – Pemba Island. With abundant rainfall and rich soil the island is also called Al Kuhdra – “”the Green Island””. Offshore lies the Pemba Channel, blessed by a multitude of fish, this is recognized by game fishermen as some of the finest waters off the east coast of Africa. As with Zanzibar, the island is dotted with ruins from its rich historical past. South of Zanzibar, Mafia Island sits at the mouth of the Rufiji River. This is another favorite haunt of big-game fishermen and scuba divers, boasting some record catches and a magical coral paradise. The amazing mermaid-like dugong breeds among the grasses of the Majira Channel, which also plays host to the awesome great white shark. On the beaches of small islands to the east of Mafia, the giant sea turtle lays its eggs. All these three Tanzanian islands allow the tourist the chance to experience the sheer romance of paradisiacal tropical isles in the sun. Capital: Dar es Salaam, 2.2 million. Shared Borders: Kenya, Burundi, Zambia, Malawi, Mozambique, Rwanda, Uganda, Indian Ocean. Highest Elevation: Mt. 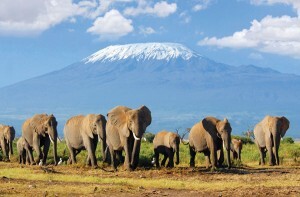 Kilimanjaro; 5,895 m. Highest mountain in Africa. The climate is tropical on the coast, on the islands and in Selous. It is temperate in the other parks. Temperatures on Mount Kilimanjaro and Meru drop to below freezing. Late March – late May is traditionally the long rainy season and is considered the “”winter period”” in Tanzania. June – late October is the dry season. June, July and August can be very cold on the rim of Ngorongoro Crater. Mnemba Island is lovely at this time of year, the evenings are cool (not cold) and the daytime can be hot. Late October – mid December is when the short rains occur. These are usually in the form of daily thunderstorms. The Ngorongoro Crater rim has a wonderful climate at this time of year. 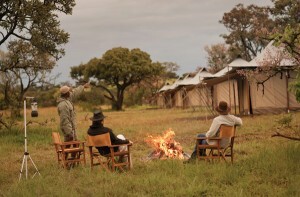 The Serengeti and Lake Manyara are quite warm and Mnemba is very hot. Mid December – March is summer weather. It is dry and very warm until March. 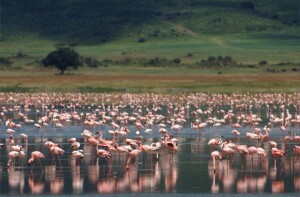 Due to its altitude Ngorongoro Crater is much cooler than elsewhere.